For the second week of Burger Month 2014, I decided to go to a burger place that I usually pass by but never really tried. Why? Well, because I have this aversion to sliders. Some people call them mini-burgers and that’s the main problem I have with them: they’re not full sized hamburgers. When I think of burgers, the image I usually imagine are the huge quarter pound patties just oozing with meaty goodness. But a slider? How can I be satisfied with such a paltry serving of beef? Well, it’s about time if my prejudice to these tiny sandwiches is justified or not. 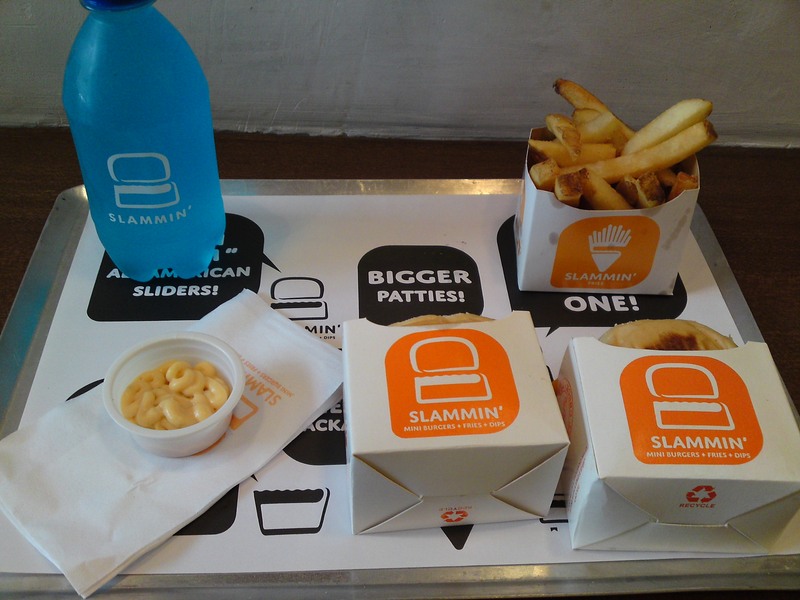 I decided to try out Slammin’ mini-burgers which specializes in sliders and fries. 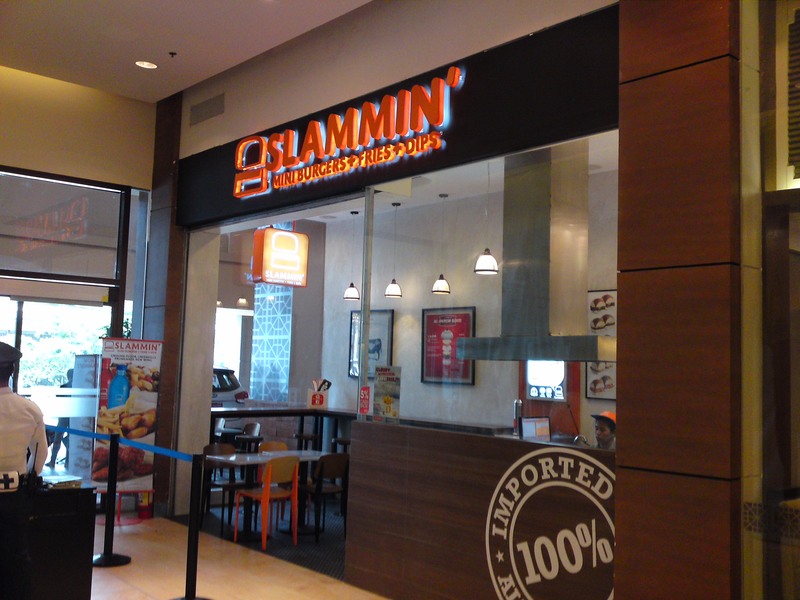 The Slammin’ branch I tried is nestled in an out of the way location of the Greenhills Promenade. If you don’t know where to look, you’ll probably not even see it. The store is pretty tiny and cramped as well. It only has enough room for one 4-seater table in the center of the store and the rest of the walls are lined with bar tables. Not that I’m complaining. It’s just that I think, if you’re a moderately sized group, you may skip this place because it is rather small. But it’s never about the location or the size of the place. It’s all about the burgers! You know, I just realized how hypocritical of me to say that size doesn’t matter when I’ve been skipping on trying out sliders for precisely the same reason. Anyway, I have to give credit to the guy that developed Slammin’s menu because they do have a rather unique selection of items. There’s the John Candy (burgers with bacon, cheese, onions and salted caramel), Romeo and Juliet combo (bacon, cheese and strawberry jam) and The Farm (100% beef patties and beer battered fish fillets). Not wanting to try something too adventurous, I decided to go with something relatively simple: their Bacon N’ Mushroom burgers. So, as these were sliders, I had to get at least two of them. I was thinking I should order three but, since I did have a big breakfast (literally. It’s the one you can order from McDonald’s), I just went with two. Of course, I had to order fries and a drink to go with them. I have to compliment Slammin’ for their presentation. Everything comes in neat little boxes. It’s really aesthetically pleasing to look at all your food laid out in convenient little containers. It’s a small thing but it really does look cool. So, the time came when I had to take my first bite into one of those burgers. Like I said earlier, I have this problem with sliders because of their size but I’m certainly glad that these mini-burgers were really big on flavor! I was pretty amazed myself at the juiciness of the beef patties. It had the right amount of fat to keep things from becoming too dry. And the meat was done perfectly for both of the burgers I had. I actually think the size of the burgers helped them to taste as good as they did since they didn’t have to cook it as long as they would’ve if the patties were larger. 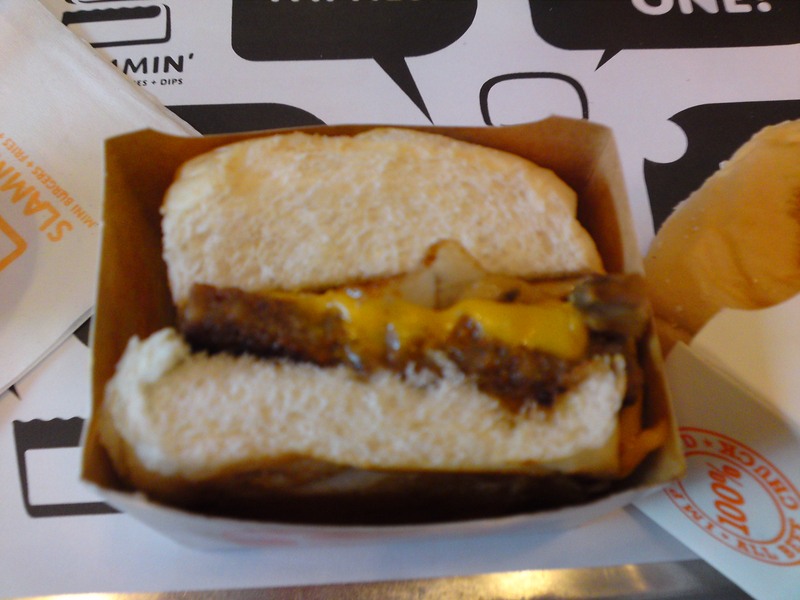 The cheese was also melted on top of the burger, which I always appreciate on a burger. While everything tastes better with cheese, it tastes even better if it’s gooey, melted cheese. I’m glad Slammin’ understands this fact. The mushrooms were the regular canned mushrooms so they weren’t that special but I think they went well with the burger. The buns also were toasted just right. If I have one issue with Slammin’s Bacon N’ Mushroom burger, it would be the bacon. While I did see them fry it, the bacon wasn’t crispy at all. Because of this, entire bacon strips would be dragged out of the burger each time I took a bite. Okay, the bacon was salty and tasted great but I always want crispy bacon on my burger as it adds a much needed contrast to texture when eating it. It wasn’t a deal breaker in any way. I still walked away feeling satisfied with the burgers. In fact, the two burgers I got were so good, it made me wish I got the three of them! I have to also mention the fries since they are pretty noteworthy. Each fry cut was huge yet still really had a nice crunch to them. I got the fries with the jalepano dip and, while I did enjoy the fries, I was disappointed with the dip. I could taste the jalapeno flavor but I couldn’t detect any heat from it. Not spicy at all and it’s a real shame! Thanks to Slammin’, I think my animosity to sliders is over. Slammin’s Bacon N’ Mushroom burgers were really good and I’ll be definitely coming back to try the other burgers they have. They seem to have a handle on what tastes good. Maybe I’ll even try the one with caramel sauce next time! 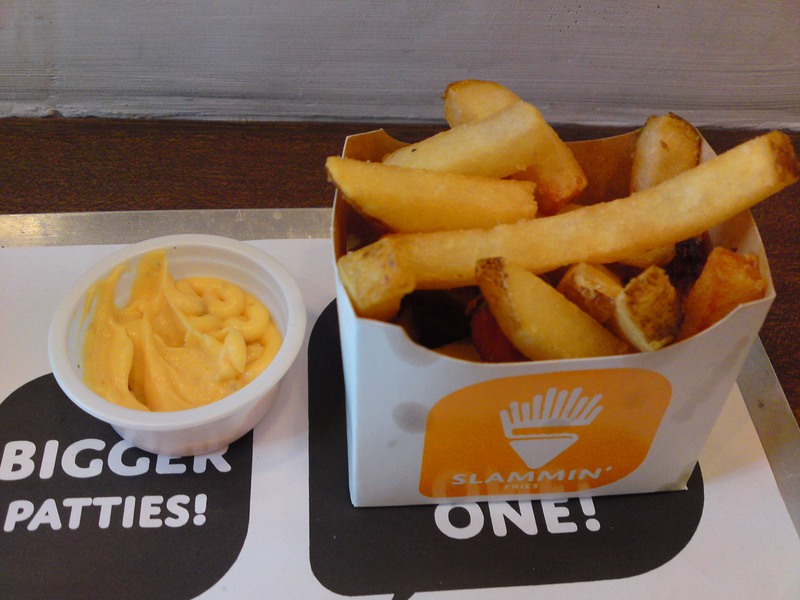 Have you tried Slammin’ yet? What did you think of their sliders? Let me know your thoughts in the comments section below!